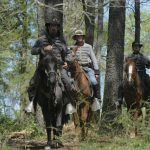 Join Jefferson’s Tourism Director, Jeff Campbell, for an out and back walk for an “Across the Bayou View” of the Jefferson Confederate Powder Magazine. The structure is the only surviving powder magazine in Texas. The walk is approximately 1/3 Mile in each direction. Call 903-665-3733 for reservations/There is no charge. If you have a few minutes today, you should definitely take time to read the wonderful article in this month’s Texas Monthly about my town of Jefferson Texas. The photographer and writer were here for our annual Battle Of Port Jefferson Civil War Re-Enactment that takes place the first weekend in May every year. They did a wonderful job of portraying our annual event. Our Pilgrimage Weekend and Battle Of Port Jefferson Civil War Re-Enactment are splendid affairs that have people showing up in period dress, fighting skirmishes and battles on our brick lined streets, touring our amazing antebellum homes and attending our grand balls. If you have not been here for this weekend, then you should put it on your bucket list. It is a must do and must see. I will even serve breakfast for you in my Civil War gown. This past weekend was Jefferson’s 64th Annual Pilgrimage and Re-enactment of the Battle of Port Jefferson. 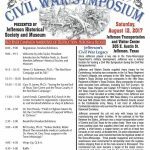 Our Battle of Port Jefferson re-enactment is the largest Civil War re-enactment in the State of Texas. The weekend kicks off with four of our historic homes opening for tour. This year, we had a wonderful assortment of homes in different styles and architectures. This was one of my favorite homes on tour and for a very unique reason. 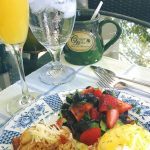 It is the sister house to the Carriage House Bed & Breakfast. I need to do much more research but I think these two historic homes must have a shared history. I walked through this house and marveled at how the layout matched my own house. I walked away with a ton of new ideas. The Angel Rose house was also built in 1920 and is a Craftsman kit house ordered out of the Sears and Roebuck catalog for $900. The home has had many additions added to it over it’s years and has been fully restored all the way to traditional Craftsman paint colors. This amazing home is a beautiful example of a classic Southern Colonial Greek Revival home. This property sat empty for many years and was purchased last year and is in the process or being restored. Only the carriage house and the pool house were on tour this time since they are the only structures that have been completed. The main house is still very much a work in progress. These beautiful buildings sit on a large piece of land that used to be a cotton and pecan plantation. This home built in 1852 is one of the oldest homes in Jefferson and was built by one of the of the original founders of Jefferson, Allen Urquhart. The rest of the house (three front rooms) was added in 1855 by a local merchant by the name of William Clark (hence the name, William Clark House). I loved the sunny yellow paint that many of the rooms were painted in. It gave the entire house a cheerful feel to it. This is one of the grandest homes in Jefferson filled with amazing art and priceless antiques. This home was built by Col. David Browning Culberson who is famous for many things including defending Abe Rothschild at the Diamond Bessie Murder Trial. This house is another example of the traditional southern architecture of the time, Greek Revival, and was inspired by a Greek Temple. The home tour was not the only thing going on in town this past weekend. 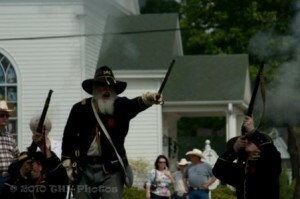 The town was full of Civil War re-enactors trying to recreate life in 1864. Entire families were living in tents set up in various parks and lots throughout town. 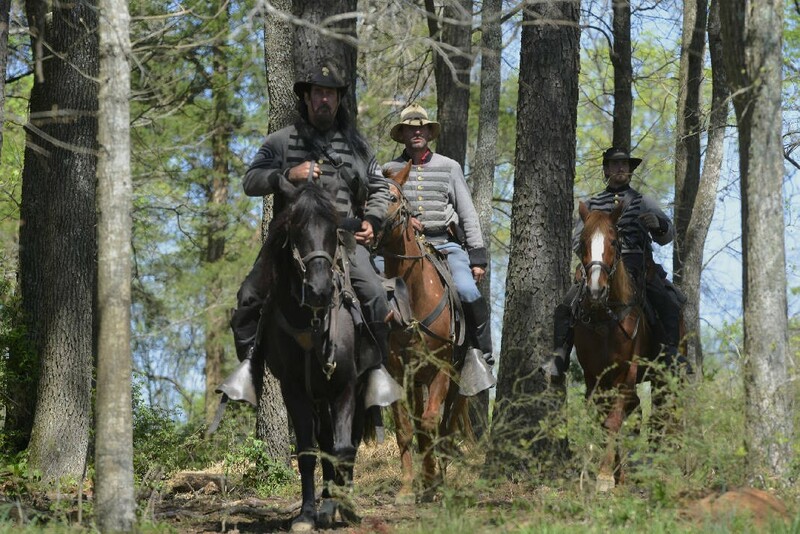 Not only did they dress in traditional Civil War garb, but they fully immersed themselves in the lifestyle of the time. 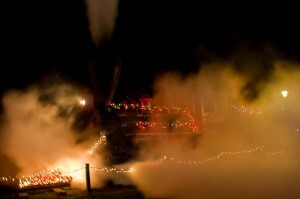 One of the fun events of the weekend is the annual Pilgrimage parade Saturday morning. Tom and I are members of a local tourism organization called the Riverport Ambassadors. 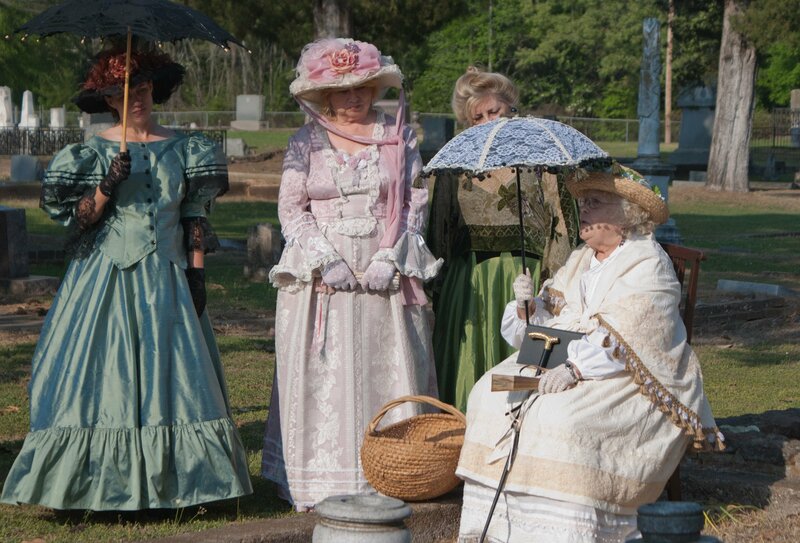 We dress up in period dress and assist the tourists on weekends. We do step on bus tours, and educate the public on Jefferson’s colorful past. Like many local organizations, we participate in the Pilgrimage parade. You can’t see me real well, but that’s me in the middle in the sea foam green dress with the black parasol. 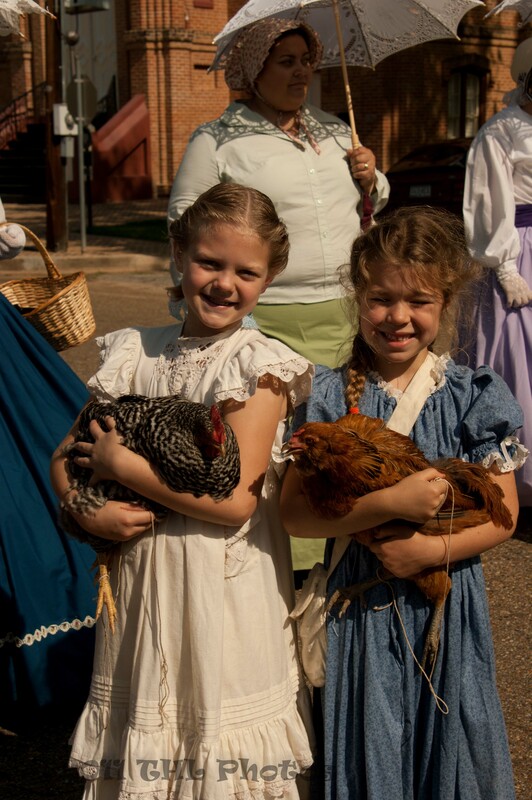 The parade ends with a gun battle and a skirmish in our beautiful Historic Riverfront District before the Civil War heads out to the battlefield set up at Tuscumbia Ranch. In addition to all of these fun activities, we also have a quilt show, an heirloom plant sale, an art show, the Grande Hertiage Southern Ball, the Great Locomotive Chase, the Diamond Bessie Murder Trial play, and evening Twilight Garden Strolls. 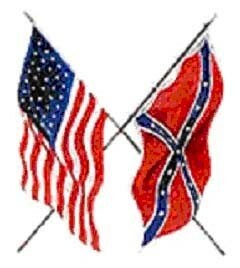 Today is the 150th anniversary of the start of the Civil War. East Texans were a 1000 miles away from the first canon fire at Ft Sumter, and at that exact moment, they were all more concerned with their cotton farms and timber trade. Here in Jefferson, we were a bustling and busy riverport full of the promise of a bright and profitable future. 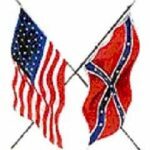 As our high school teachers taught us all, the Act of the Northern Aggression (as it is referred to this side of the Mason Dixon Line) was a war that forever changed the South. The War Between States didn’t quite make it here to East Texas and to Jefferson. 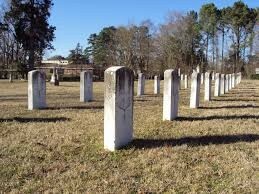 It ended in a bloody battle in Mansfield Louisiana but the repercussions are still felt here today. 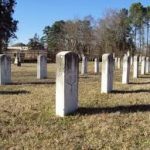 In fact for those of us that live in the South, the spectre and the remnants of the Civil War are all around us with grave markers still adorned with flowers and old confederate powder magazines along busy boat tour routes . It often feels like a not so distant memory…almost as if it is something that we discuss when friends gather around. In fact, we Southerners feel compelled to re-enact it year after year after year (almost as if we are expecting the outcome to change). Here in Jefferson, we host the Battle of Port Jefferson the first weekend of May each year. In Jefferson, we try and imagine that it is 1864 all over again. What would have happened had the war not stopped downstream from us? What would have happened at the Battle of Port Jefferson? We know that the Union Army wanted to take what it considered a very strategic port, the Port of Jefferson. What would that battle have looked like and what would have happened to Jefferson? If you are looking for something to do May 6th through the 8th, then come on down. 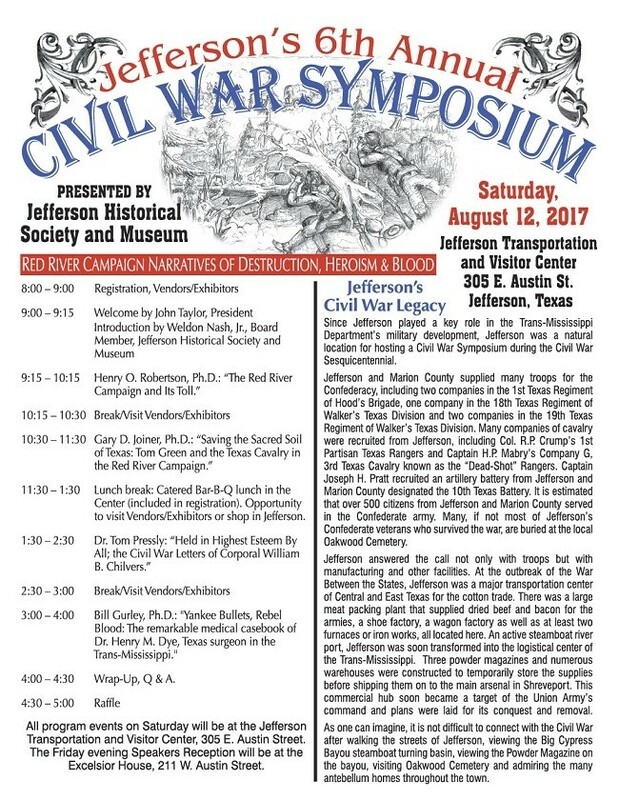 The largest Civil War re-enactment in Texas will be right here that weekend. I have to tell the story of last year, because as you know it is never a dull moment here at the Carriage House Bed & Breakfast. 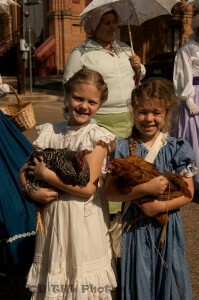 Tom and I were still serving breakfast when the Civil War broke out in front of our house…seriously, the Civil War. I was pouring a cup of coffee when a canon was fired and a brigade of soldiers on horseback came clomping and racing up the street. It startled me so badly that I almost dropped the carafe of coffee in one of our gentleman’s lap. Now you have to admit, you have never stayed at a B&B were breakfast was interrupted by the Civil War before, now have you. So Tom and I did what any sensible innkeeper would do. We told everyone to grab up their cups of coffee and head out to the porch where we watched the skirmish from the comfort of rocking chairs and porch swings. It was breakfast and a show. This year, we are going to be smart about it and serve breakfast a little earlier, so everyone will have time to find a place to watch the battles and skirmishes. You have to admit though, that makes a pretty good rookie innkeeper story.